What are Typical Magnesium Deficiency Symptoms? Can magnesium chloride absorb through the skin and be taken up by tissue cells inside the body? Yes, for thousands of years cultures around the world have been practicing balneotherapy, which is soaking in mineral waters or hot springs to absorb minerals through the skin and alleviate degenerative conditions such as arthritis. In the last century magnesium chloride and magnesium sulphate (epsom salts) have been harvested and used for baths and footsoaks at home. Magnesium oil, which is a solution of magnesium salts and water, was also used to spray on to muscles and joints for pain and cramps alleviation. Once magnesium ions are fully dissolved and ionised they can bass through cell walls from extra-cellular to intra-cellular spaces. In 2009 Elektra Magnesium Cream, the first of its kind, was created as a natural skin conditioner and more ‘user-friendly’ supplement to deliver magnesium transdermally. Its rich complex lipid structure help transport magnesium ions through the epidermis, whilst keeping the skin in great condition with a more youthful and hydrated complexion. See STUDY Transdermal Absorption of Magnesium Cream. There are no toxic ingredients in any Elektra Magnesium products. The amount of essential oil for fragrance is also at a trace level – only enough for aroma, but not therapeutic level. The essential oils have a good safety profile and not considered dangerous for pregnancy (like some other essential oils can be). If you have sensitive skin use Magnesium Cream, which has higher fat content and mild magnesium content. You can supplement with extra magnesium bathing, which is also very gentle. The body’s skin takes magnesium up as a reservoir, holding it until the body absorbs it in its own time. There is no danger to overdose ‘internally’. Absorption time is totally determined by the individual’s needs at the time and this can vary a lot. Many women have used our magnesium body products during pregnancy since 2009 and we have had no adverse reaction reports from it to date, but on the contrary, many glowing positive reviews regarding anti-inflammatory or calming effect to promote better sleep. We also suggest adding magnesium footsoaking or bathing to your weekly regime for magnesium uptake, as this process also helps detoxification and soothes sore ankles. Pregnancy requires an increase in magnesium compared to average needs, due to extra cell building. Food supply has become more deficient over time. Therefore, using the transdermal magnesium absorption method is an ideal way to supplement diet with this vital nutrient ‘naturally’, without having to digest tablets or powders. The skin is made up of collagen structures that hold water and lipids (fats), as well as nutrients like vitamin D. Massaging with Elektra Magnesium products delivers magnesium ions conveniently to the skin reservoir. 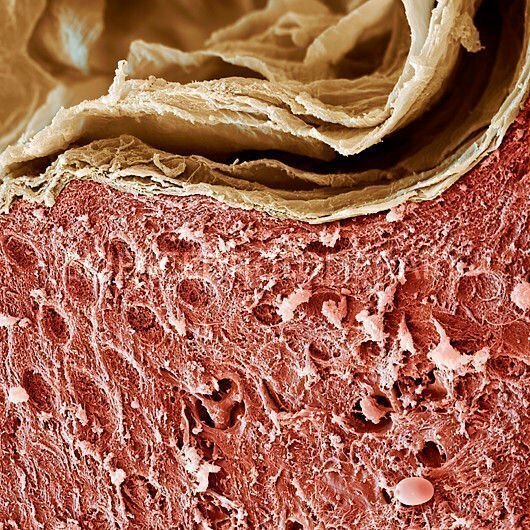 From the skin (epidermis) the body takes up what it needs via the tiny capillaries of the dermis under the skin. This process is self-regulating and the body does not overdose itself (like a tree does not take up more minerals from the soil than it needs). Unlike drugs or herbs, you cannot overdose this way… ie. ‘Nature’s way.’ If you are very deficient the body will take up the nutrients quickly. If you are not as deficient, it will take up the nutrients more slowly. The skin in this way acts as a nutrient reservoir. 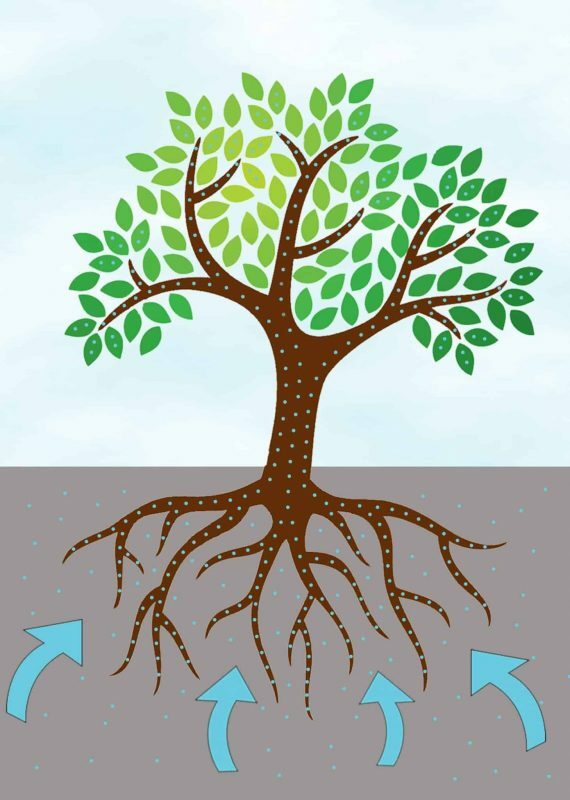 Capillary action of tree roots to absorb minerals from soil. Elektra Magnesium products used certified Fair Trade Shea Butter. Nutrition Via Skin – Feels sooooo good!